History: Nicaragua’s history is a rich one storied with various periods of political unrest and turbulence. On his fourth voyage in 1502, Christopher Columbus was the first known European to touch land in Nicaragua on the southeastern Atlantic coastline, encountering no native populations. On later voyages to the southwestern border, the Spanish conquered Nicaragua and the land remained under Spanish rule since the early 16th Century, Nicaragua went on to win its independence in 1821. Since its independence, Nicaragua has undergone many periods of political, economical, and fiscal unrest, most notably the Nicaraguan Revolution of the 1960s and 1970s which resulted in the implementation of a representative democratic republic which exists to this day. Food: Nicaraguan cuisine is a mixture of indigenous recipes, Spanish recipes, and Creole recipes as a result of Nicaragua’s history of Spanish occupation and relative location to Creole islands of the Caribbean. On the pacific side of the nation, local food is very heavily influenced by local fruits and corn-based recipes, whereas along the Caribbean coast, food tends be far more highly influenced by fresh fish caught from the Caribbean Sea. Aside from corn dishes, rice and beans is a very common staple to Nicaraguan cuisine and is commonly eaten for breakfast. Aside from corn, rice, beans, and fish, other main ingredients in Nicaraguan cuisine are: mango, papaya, tamarind, avocado, and local herbs such as yucca, cilantro and achiote. 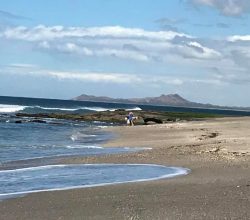 Weather and Landscape: Located along the Pacific coast, the climate of Nicaragua can, at times, be described as very similar to a climate such as Southern California with hot, dry air and little rain. However, during the rainy season, it is not uncommon to receive up to 18 inches of rain in a matter of hours or days. The Caribbean side, however, is equally hot, but much more humid. The landscape of Nicaragua is mostly desert along the coasts, separated by what is commonly referred to as the Central Highlands, which comprises of rugged mountains and green valleys that typically drain towards the Caribbean side. El Lago de Managua and El Lago de Nicaragua are the two largest lakes in Nicaragua, connected by El Rio de San Juan which flows along the border between Nicaragua and Costa Rica and drains into the Caribbean Sea. 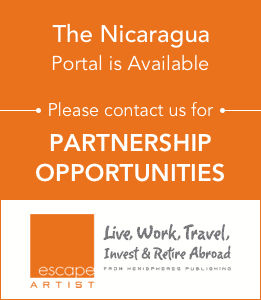 Working in Nicaragua: If you are not planning on retiring abroad in Nicaragua and are looking to work, there are a variety of residencies and visas you can apply for. Due to the large increase in foreign money and investment coming into Nicaragua, getting a residency or visa in Nicaragua is a relatively straightforward process. 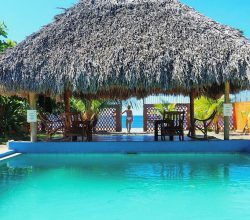 However, unless you are planning on investing, there are few opportunities to work abroad in Nicaragua. Simply put, your competition in the workplace means you’ll typically work for about $1 an hour. Living/retiring in Nicaragua: Due to its pristine beaches, exotic volcanoes, and gorgeous colonial cities, Nicaragua has become one of the hottest tourist destinations. Life in Nicaragua includes many of the same activities that tourists enjoy: swimming on the beach, surfing, hiking, and travelling to many of the destination cities, such as Grenada. Along with the climate and low cost of living in the country, Nicaragua has become a key destination for expats to live and retire abroad in. In fact, you will likely be able to live in a style of luxury you are not typically accustomed to, due to the great affordability of Nicaragua. If you are living simply, you can get by on $1200 a month, or $2000 a month if you are living a more upscale quality of life. Investing in Nicaragua: The fruits for investment in Nicaragua are ripe, to say the least. Despite being ranked as the second poorest nation in North America, Nicaragua’s economy has steadily grown over the years, especially through Foreign Direct Investment (FDI), which has shot up 33% in 2012 and now makes up roughly 12.4% of the nation’s GDP. Furthermore, there are fiscal incentives that are currently luring big money, high concept investments into the nation. One of which guarantees a 100% tax free incentive of VAT, income tax, and more for the first ten years of investment. Typical investments abroad in Nicaragua include textiles and light manufacturing, tourism, renewable energy and agribusiness, fishery, and forestry. Residency in Nicaragua: Nicaragua is an excellent option for obtaining residency abroad in. The Nicaraguan government has made many moves in recent years to make it easier to obtain residency for foreigners. This is because the country knows the benefit of welcoming foreigners inside their borders. The Law of Resident Pensioners and Retirees (Decree 628) is a good example of a law passed by the Nicaraguan government that encourages foreigners to become residents of Nicaragua. The prospect of living abroad in Nicaragua is an exciting one to say the least. Factors such as incredible natural beauty, immensely cheap cost of living, and growing economic and political stability are just some of the reasons that are encouraging travelers and expats alike into vacation and permanent homes within Nicaragua’s borders. While many expats desiring to relocate to Southern Central America seek out Costa Rica as their top destination, Nicaragua offers a similar climate at a more affordable price without all the heavy tourist and commercial development that is flooding into Costa Rica’s borders. If you prefer a local coffee shop to a Starbucks, than Nicaragua just might be for you! The natural beauty is another aspect of life in Nicaragua that expats greatly enjoy. Accompanied by a warm, dry climate, Nicaragua boasts waterfalls, dormant volcanoes, pristine beaches and lakes, rainforests, and dozens of protected national parks and forests. Simply put, Nicaragua is a hidden gem for any nature lover’s future paradise. The natural riches that Nicaragua contains within its borders greatly influence the locals’ and expats’ daily life and lifestyle. For instance, one can enjoy a historic city like Granada and enjoy its colonial architecture and vibrant nightlife; or, one can buy property on the beach and indulge in the laid back life on the coast. With many different options to choose from, and with alternative options within a short distance, an expat can choose the direct environment they wish to surround themselves in and still be within a short drive to all the other lifestyles and experiences Nicaragua has to offer. In addition to the idyllic natural paradise and cheap cost of living, Nicaragua has been making tremendous strides forward in terms of economic growth, political stability, and social progress. The political stability is also a sign of vast improvement in Nicaragua. In 1984, democracy finally took effect after half a century of strict dictatorship. Six national elections and almost a dozen regional and municipal elections have taken place since then. Transfers of power have occurred, further decreasing tensions. One of the first successful transfers of power took place in 1990, when Sandinista leader and president Daniel Ortega conceded to Violeta Chamorro. Each of the following presidents have worked hard to contribute to building the nation, furthering the success and national stability. With this peace and political stability, Nicaragua is currently the safest country in the Central America, Panama, and the Dominican Republic region. Compared to other countries in Central America, some of which have homicide rates as high as 90 homicides per 100,000 people, Nicaragua’s rate sits at a low 10 per 100,000 inhabitants. The police force in the county has the lowest budget in the region, dispelling the correlation that low income leads to high crime. Nicaragua also ranked third in having the lowest robbery rate. Nicaraguans feel very secure in their justice system. In a 2011 report, 65% of Nicaraguans have confidence in the criminal justice system, ranked second in Latin America. After years of political evolution, there is a new kind of revolution. Nicaragua is making efforts to cut back on CO2 emissions and oil imports. With steady winds, sun, and active volcanoes, Nicaragua produces no oil and gas. Instead, energy is coming from hydroelectric dams, geothermal plants, and wind farms. Electricity is being produced efficiently and cleanly. Between 2007 and 2014, energy produced by fossil fuels dropped by 50%. Since the global economic crisis of 2008, Nicaragua has seen steady and consistent economic growth. Growth has averaged 4 percent yearly, the highest in Central America. Since 2006, Foreign Direct Investment has quadrupled and exports have doubled. Job creation was the fastest in 2014.